Pithale-bhakari and thecha! Yum! I know mouth is watering, right? So sharing today Assal (pure) Maharashtrian, absolutely delicious and healthy pithale bhakri, thecha and tanduljachi bhaji recipe. 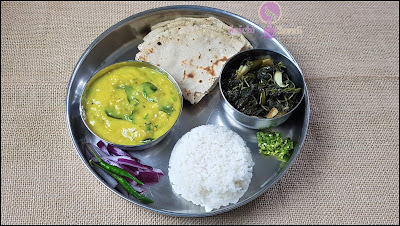 The staple meal of the Maharashtrian cuisine bhakri (jowar/bajra) accompanied by raw onion, a green chili thecha / chutney, any green leafy vegetable stir fry, pithale / jhunka and plain rice(Bhat). This meal has now become popular as street food and as a restaurant's thali menu in Maharashtra. The Maharashtrian meal contains arrays of different vegetables, pulses, pickles, chutneys, koshimbir and sweets. This Thali or plate is filled with lots of nutrients, and top of it's vegan, vegetarian and gluten-free.